A canine with special training in detecting fish demonstrated the value of its new skills Friday evening leading to charges for fishing violations against two Bridgeport men who were out on the Housatonic River in Milford. A Labrador Retriever that just completed training in the detection of illegally caught fish was used by the Department of Energy and Environmental Protection (EnCon) Environmental Conservation (EnCon) Police to find two striped bass the men had caught that did not meet minimum length requirements. As a result, Ronaldo Oliviera, 30, of Bridgeport, was issued a misdemeanor summons for possession of short striped bass and was also cited for fishing without a license. He was released on a promise to appear May 21 in Milford Superior Court. Eber Macario, 60, also of Bridgeport, was issued an infraction for fishing without a license; which carries a fine of $87. EnCon officers saw the two seen fishing Friday evening on the Housatonic River in Milford and stopped to conduct a fishing compliance check. The men said they had not caught any fish, but the officers dispatched their specially trained canine “Saydee” who searched the shoreline and indicated a “find” on a black trash bag tucked in a rocky embankment. An inspection of the bag revealed two striped bass that measured only 15 and 19 inches in length. State regulations limit the possession of striped bass to one fish per angler at a minimum length of 28” in an effort to protect the resource. “Saydee” is one of three canines from the EnCon K-9 unit that received special training in fish detection to assist in the detection of fishing violations. 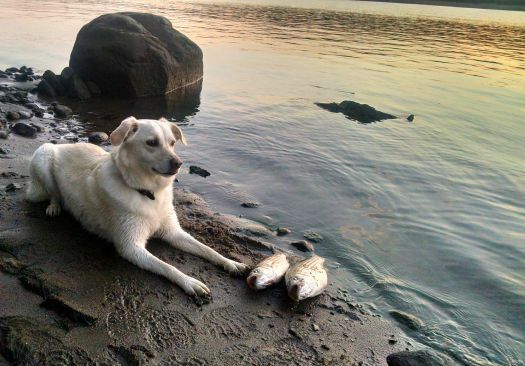 The canines have been trained to detect certain species of sport fish that are commonly caught in Connecticut, such as trout and striped bass. The canines were trained to search on vessels, under rocks, along shorelines, and other places illegally taken fish could be hidden.